Now people will be able to spot this lad, who was part of the ICC 2012 U19 World Cup team – Prashant Chopra from Himachal Pradesh. Yesterday he pummelled Punjab's attack on the opening day the Group D match in Dharamsala, ending the day unbeaten on 271 off 289 balls in Himachal Pradesh's 459 for 2. Statistically, Chopra's knock is second on the list of most runs scored by a batsman in a single day in the tournament's history, after Bhausaheb Nimbalkar's tally of 277 (he went from 24 not out to 301 not out), in his famous knock of 443 not out. There is a bigger match the 1st T20 between India and Australia - being played at JSCA International Cricket stadium in Ranchi …. Jharkhand State Cricket Association is a full member of the Board of Control for Cricket in India (BCCI), it organises international matches in the state, but JSCA did not own any international cricket stadiums, the only one being Keenan Stadium, Jamshedpur, named after a former GM of Tata Steel. The present stadium is closer to Ranchi airport ~ most importantly the home ground of Mahendra Singh Dhoni, MSD. This photo would sum it up all - Aussies in dire straits reduced to 118/8 as rain interrupted at 8.20 pm in 18.4. Indian bowlers, especially the spinners had a stranglehold on Aussie batsman. Yuz Chahal got rid of Maxwell for the 4th time in 4 games – this time to a long hop !! The man in picture, bowled having no clues is Tim Paine – a wicketkeeper-batsman who was earmarked as next in line behind Brad Haddin in Australia's line-up in 2009, Tim Paine's career was severely affected by a finger injury that required multiple operations. Paine originally broke his right index finger in November 2010, when he was struck on the hand by a Dirk Nannes delivery. Today at Ranchi in the 15th over Chahal missed a caught and bowled; 2nd one, he was beaten, Dhoni did collect neatly, attempted to break the bail – was it seeing the foot in or was that a miss ! 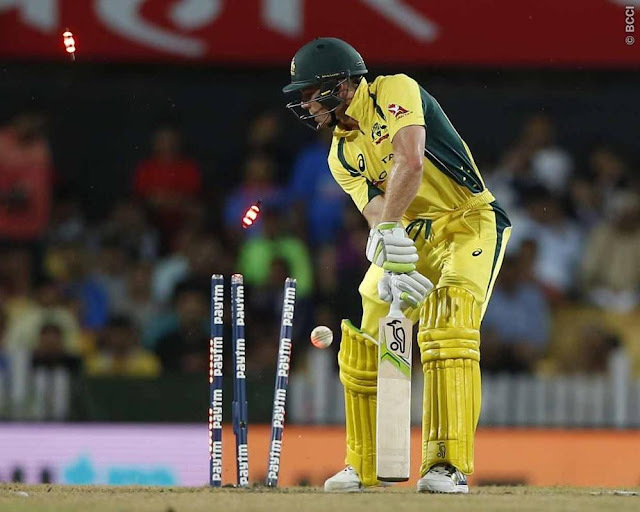 ; of the 5th Dan Christian was fooled, Dhoni was blinded and could not collect neatly, missed a stumping change – last delivery Paine pulled a long hap straight into and out of Bhuvneswar Kumar. Aussies all at sea !! Virat Kohli, won the toss and elected to bowl with rain in the air in the first T20I at the JSCA Stadium. David Warner, is captaining Australia in the series with Steven Smith having flown back home with a shoulder injury. Jason Behrendorff, the left-arm pacer made his debut with T20 specialists Moises Henriques, Glenn Maxwell, Daniel Christian and Andrew Tye all finding a place. India returned to their regular limited-overs opening combination with Shikhar Dhawan reuniting with Rohit Sharma. Dhawan, who had missed the ODI series to be with his ailing wife, came in at the expense of Ajinkya Rahane. India preferred the wristspin of Kuldeep Yadav over the orthodox left-arm spin of Axar Patel, who had played the last two matches of the ODI series. Bhuvi had 1; Bumrah 2; Hardeek1; Chahal 1 and Kuldeep 2. In Ranji Trophy, Prashant Chopra's 338, the tenth-highest individual score in the Ranji Trophy and the first triple-century by a Himachal Pradesh batsman, helped the side amass a record 729 for 8, their highest total in the tournament on the second day against Punjab in Dharamsala. Chopra began the second day on 271 off 289 balls and barely let up his momentum, reaching 300 off 318 balls. A return catch to part-time offspinner Pargat Singh ended his 363-ball stay at the crease, by which time Chopra had hit 44 fours and two sixes. Saurashtra's bowlers took 16 wickets on the second day in Rohtak to take control against Haryana, who need another 78 runs to make Saurashtra bat again. Shaurya Sanandia took six wickets on the day - four in the first innings and two in the second - while Kushang Patel and Jaydev Unadkat took four wickets each on the day, as Haryana were forced to follow on after being bowled out for 107. Back home, Ravichandran Ashwin, and Tamil Nadu pace-bowlers, Lakshminarayanan Vignesh and Krishnamoorthy Vignesh, took two wickets each to keep Andhra in check on the second day in Chennai. The three bowlers combined to leave Andhra at 64 for 5 in the 26th over before Bodapati Sumanth and Ashwin Hebbar punched their way to a century stand for the sixth wicket, to ensure Andhra took a 55-run lead by close of play. Cricket has always been fun, when it comes about visiting India and facing against India. Anyways this series was full of entertainment and it is good to know more about it.